Ticket Prices: $30.00 GA or $120.00 VIP (2x tickets). Tickets: Various entry prices starting from $40.00 available exclusively from Eventfinda NZ. Please scroll down for more details. From 8.00pm, you’ll be treated live music from The ZacAttack Band performing alongside ritzy, titillating burlesque from top-notch burlesque artists from across the country, including Sophia St. Villier, Dolly DeStory, Hannah Tasker-Poland : Artist, Lilly Loca and Bonita Danger Doll, with rapturous MC Clever Hansel at the helm. ♦ Only 60 tickets available. ♦ Admitted to the club from 7.00pm. ♦ A complimentary glass of bubbles on arrival. ♦ Watch entertainment either seated or standing. ♦ Only 2 packages available. ♦ You'll be seated at an 8 seat booth, located in close proximity to the stage to watch the entertainment (shared with other patrons). ♦ Admitted to the club from 6.30pm*. ♦ Exclusive use of the club along with the 'Whisper No.9 VIP Tables' from 6.30pm - 7.00pm. ♦ A complimentary glass of bubbles on arrival per person. ♦ Table service from the Cassette Nine staff. ♦ A delectable antipasto platter for you and your date to share. ♦ Your choice of one of our ‘Classic Cocktails’ per person. * please ensure you are seated and order your cocktails by 7.00pm. ♦ Only five tables available. ♦ Admitted to the club at 6.30pm*. ♦ A complimentary bottle of bubbles per table. * please ensure you are seated and order your meals by 7.00pm. ♦ Speakeasy. Our neighbours may be sleeping. ♦ Proper attire is required for admittance. ♦ Libations will not be served to intoxicated club members. Drink responsibly. ♦ Mind your manners and be considerate of others. ♦ Quality cocktails, teapots and food take time. Please be patient. ♦ In the case of a raid, down your drink post haste. ♦ Think a fellow club member could be the cats meow, but haven’t been introduced? If you’d like to be acquainted, ask one of our hostesses to introduce you. ♦ Do refrain from talking on your phone and smoking inside the bar. Kindly use the outside area to take calls and smoke. Whisper No.9 has a strict dress code, which all people who attend must adhere to. A Cocktail Gown or Dress. Optional: Ritzy top and skirt/pants. Dress shoes, no matter what attire you wear, are compulsory. If you wish to meet a potential date at Whisper No.9, ensure you wear a red napkin or ribbon upon your person. The best places to wear it would be in your lapel if you are donning a suit or shirt, or if you’re wearing a dress, pinning it upon your chest or wearing it around your wrist as they will be the most visible there. Left your red ribbon or napkin at home? Don’t fret, our hostesses will be equipped with them at the top of the stairs as you arrive. Our friendly hostesses are also available to introduce you to prospective dates. Ask politely, and they will help you make a fellow club members acquaintance. "Whatever you do, do not feed the plant". Time: Doors open 6.30pm. Show starts 8.00pm. Ticket Prices: $15.00 via Eventfinda NZ. $20.00 on the door. Ticket Release Date: Wednesday 15th August via Eventfinda NZ. DJ’s Andrew Black, Sondo’s & Smokey. From the band of misfits who bought you sell-out Halloween events 'A Very Rocky Horror Halloween' in 2015 and 'Cult Horror Halloween' in 2017, as well as many wonderful burlesque and variety shows comes their first musical inspired Halloween event, 'Little Club of Horrors'! From the dusty corners of Skid Row, to the alluring Frankenstein's Place, our theatrical ensemble of spooktacular performers will bring your favorite characters from iconic horror musical films to life. Featuring burlesque, drag, musical theatre, puppetry, magic, adagio and circus acts inspired by films 'Little Shop of Horrors', 'Rocky Horror Picture Show', 'REPO! The Genetic Opera', 'Sweeney Todd' and 'Labyrinth' (for good measure). Not only that, we’ll have DJ's providing spine-tingling tunes to see you dancing the Time Warp through to the early hours of All Hallows Eve. “So, come up to the lab and see what’s on the slab!” We can guarantee you a hauntingly fun and spooky night of entertainment. Dress up is encouraged, with prizes from BodyFX on offer for those who are brave enough to take it on Frank n’ Furter's drag. “I see you shiver in ANTICI….PATION!” Tickets will be on sale from Wednesday 15th August on Eventfinda.co.nz. As per request, we will be pre-selling tickets so you don't miss out on the door. GA tickets will be $15.00 via Eventfinda and $20.00 on the door. Only GA available. A word to the wise.. Our Halloween events prove to be very popular and as such, they sell out very quickly upon tickets being released. Please put a reminder in your calendar so you do not miss out. Va Va Voom Productions and Cassette Nine, who have collaborated to produce a g-string of sell out burlesque shows since 2015, present the highly anticipated, brand new nation-wide burlesque competition, PRESS PLAY - Burlesque Improv Competition! With MC PIOTR from Uzbekoslavia! Judged by Velvet DeCollete, Steven Lyons Comedy and Duchess deBerry! Want to splash out and attend the night in style? Be sure to purchase yourself a VIP ticket which includes a seat at either a cabaret table or booth with the best views in the house. To tempt you further, we’ll throw in a house drink or bubbles to wash down your choice of meal from the specially crafted Cassette Nine menu. Oh, and did we mention you also get an exclusive VIP goody bag filled to the brim with treats from our sponsors? Gold “Neon” Sponsors: BodyFX, LadyTramp Designs Ltd & Studio81. Silver “Fluro” Sponsors: Bambina Burlesque Academy NZ, Go-Go Glitter &Merci Mille Fois. Bronze “High Rise” Sponsors: Print Mighty & Rita Sue Clothing. Cabaret tables sit 4x people. If you wish to book a whole table, please buy all 4x tickets. There are four tables total. The VIP booth seats 8x people. If you wish to book it exclusively, please buy all 8x tickets. Putting the va-va-VOOM into Valentines, Cassette Nine and Va Va Voom Productions, the purveyors of sell out burlesque variety shows since 2015, are back with a ba-da-BOOM with their first show of 2018. 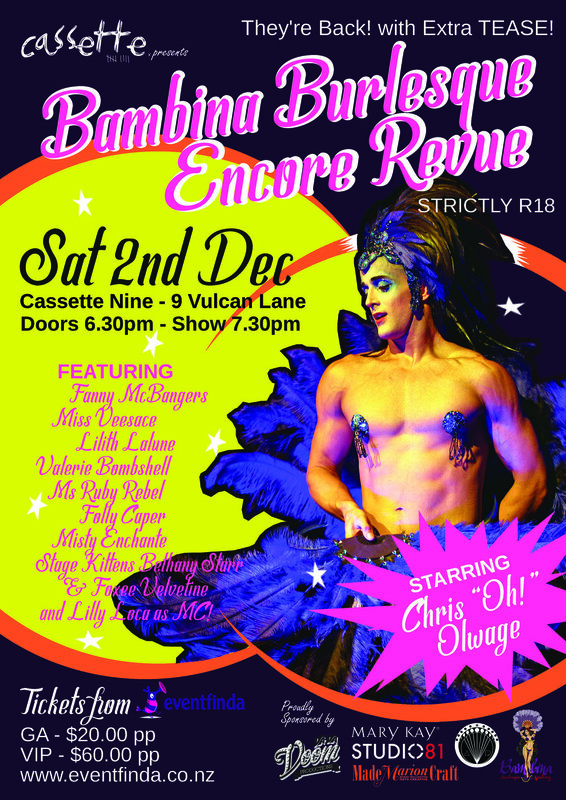 Cupid’s arrow is pointed straight for Cassette Nine as our beautiful bouquet of award winning burlesque beauties razzle, dazzle and show all you love birds (and singletons alike!) 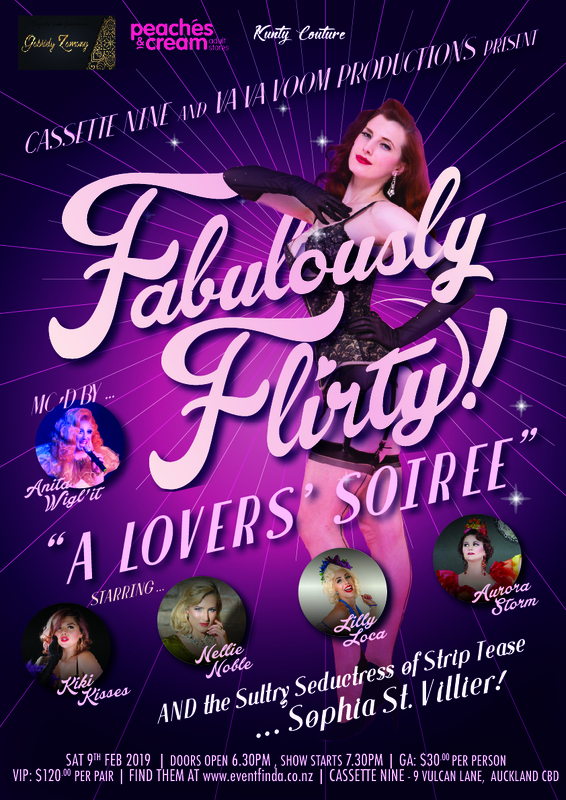 a fun and titillating night of burlesque entertainment. ❤ Headliner & NZ’s Little Marilyn (currently visiting from her new home in Shanghai), Dolly DeStory! ❤ Most Dazzling Dancer Grand Tease Finale 2017 & Miss Burlesque Beauty 2016, Kiki Kisses. ❤ Reigning Duchess of the New Zealand Burlesque Festival 2017 & Best Classic at the Grand Tease NZ Finale 2017, Miss Kitty Rose. ❤ Reigning Supreme Grand Tease Winner 2017 & Grand Tease Hamilton 2017, Lilly Loca. Want to really impress your date? Be sure to purchase the best seats in the house with our VIP tickets! Each VIP ticket includes a seat at either a cabaret table right up close to all the action. To tempt you further, we’ll throw in a house drink or bubbles to wash down your choice of meal from the specially crafted Cassette Nine menu. Oh, and did we mention that as the cherry on top you’ll also get a special Valentine’s Day inspired VIP gift bag from our wonderful sponsors? What more could you possibly want in a romantic evening? ❤ There will be prizes for best dressed from our generous sponsors, so make sure you dress to impress! ❤ Themed world famous teapots and cocktails will be available for purchase. ❤ VIP cabaret tables sit 4x people. If you wish to book a table, please buy 4x tickets. ❤ The VIP booth seat sits 8x people. If you wish to book the entire booth, please buy all 8x tickets.